I’m beginning a new project. 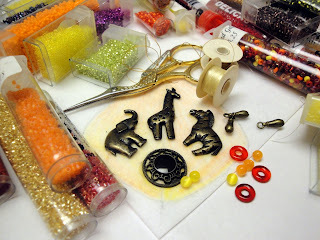 I found three old scatter pins, an elephant, a giraffe, and a zebra and I immediately thought about the Big Top and a traveling circus. I started gathering my yellow, orange and red beads; adding a little gold for glitz and some green and purple for contrast. And I’m on my way!